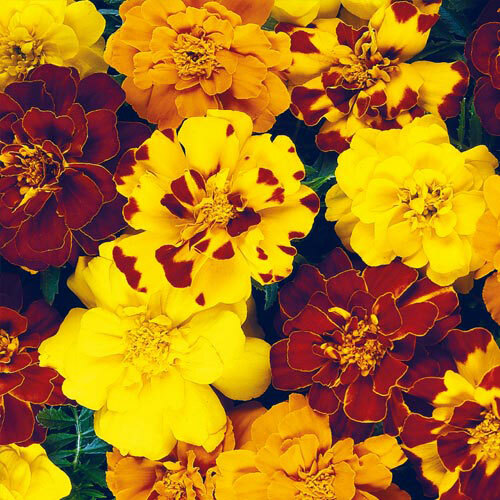 Durango Outback Mix Marigold | Gurney's Seed & Nursery Co. Tons of double blooms early summer to frost! Uniform, extra-large, double flowers on bushy, vigorous, dark green, 10 to 12-in. plants. Festive, red-tipped yellow bolero accents deep red, tangerine and yellow blooms. Plant in sunny beds, containers and window boxes! Germination7 - 10 days at 70 - 75 degrees F.
Seed CountApproximately 50 seeds per packet. CommentsSets the standard for anemone type marigolds, tons of blooms, strong stems, early blooming, uniform extra large blooms, bushy vigorous plants. Mix contains: Bolero (golden-yellow tipped with red), Red, Tangerine and Yellow.